Is your baby growing, but you aren’t sure it’s time to lower their crib? Maybe your baby has reflux, and you’re considering tilting their mattress to help — but want to be sure it’s safe to do so. Parenthood brings on a whole slew decisions and specific considerations you never had to keep in mind before — that can include your baby’s sleeping position and what height to set their mattress at. What are the ins and outs of altering your baby’s crib height? Is adjusting the incline of a crib mattress safe? Read on — we’ve got the low down and the information you need. Why Raise The Crib Mattress? Why Lower The Crib Mattress? There are a few quintessential sleep safety basics when it comes to babies. Having a working knowledge of these standard practices will help protect your baby from Sudden Infant Death Syndrome — otherwise known as SIDS. SIDS is the unexpected death of an otherwise healthy child under the age of 1 and, in instances when it does occur, happens mostly during sleep. In 2016 the American Academy of Pediatrics announced new sleep safety guidelines to protect babies from SIDS — there are a few key basics to follow (source). The AAP recommends sharing a room with your baby for the first six months to a year of life. It’s key to note that room-sharing is not the same as bed-sharing, which has been known to be a hazard to infants. It’s important to place your baby in a separate sleeper — such as a crib or bassinet — that’s in the same room as you during the night. Some parents also choose to use a co-sleeper, which keeps your baby within arm’s reach, but also safely on a separate sleep surface. To reduce the risk of SIDS your baby should always be placed to sleep on their back, never their side or stomach. The only time it’s okay for baby sleep on their side or stomach is when they’re already able to roll over by themselves — and turn themselves back over. At that point, you should stop swaddling them — a baby who rolls over in a swaddle will not be able to return to their back, which creates another suffocation risk. When they reach this stage, continue to place your baby on their back to sleep — but if they roll over independently it’s less necessary to flip them right-side up again. Sleep positioners seem look like a good idea, but according to the FDA, they should never be used (source). These pose a danger because babies can either roll over and have their face pressed against the positioner itself, or become trapped between the crib and the positioner (source). Both of these situations may lead to suffocation. Sleep positioners are not the only item you shouldn’t put in your baby’s crib. Parents should avoid extras including stuffed animals and toys, pillows, or loose blankets. The only safe blanket in a crib is one that’s swaddling your infant. Sleep sacks are also an appropriate and safe choice. Excess clutter can pose a suffocation risk. When you first put together your baby’s crib, you may not have set the height of their crib mattress with intention. Once you brought them home, you may have realized that the height of the mattress was less-than-ideal. Did you put your baby’s crib mattress at a low setting before they were born, not thinking of how difficult it may be to lay them safely inside? This happened to me with my oldest because — there’s no other way to slice it — I’m a short mama. I put my mattress on a low setting and soon found myself leaning completely over the side of the crib to lay her down. I was at risk of falling into the crib with her! Moving the crib mattress up to a higher position made it a safer environment for both her and I. Even if you’re a mama graced with height, bending over into the crib might be painful if you’re recovering from a cesarean section. In that case, raising the crib up can make it easier for you lay baby down while you’re still healing. Gastroesophageal reflux disease (GERD), is commonly simply called reflux. Babies suffering from GERD can find it uncomfortable to sleep on their backs, since laying down flat allows the acidic stomach fluids to move up towards their esophagus. When the stomach acids reach the esophagus, it may cause a painful burning sensation. It may also cause your baby to vomit or spit-up, leaving you both with long nights and little sleep. In cases of reflux, having your baby sleep in an inclined position can help keep the stomach acid down in your baby’s stomach. However, there is a safe way to execute this move — and it’s one we’ll get into later in this article. Congestion and mucus buildup caused by a cold or allergies can cause your baby to lose sleep and struggle to breathe throughout the night. Safely inclining baby’s crib mattress can help relieve the pressure caused by the mucus buildup and allow your baby to both breath and sleep better. Now you know why a mama might want to raise her baby’s crib level and angle the mattress, but the real question is, is it safe? The answer is yes — with some key specifications. It’s safe to incline your baby’s crib at an angle if they are suffering from GERD or congestion (source). 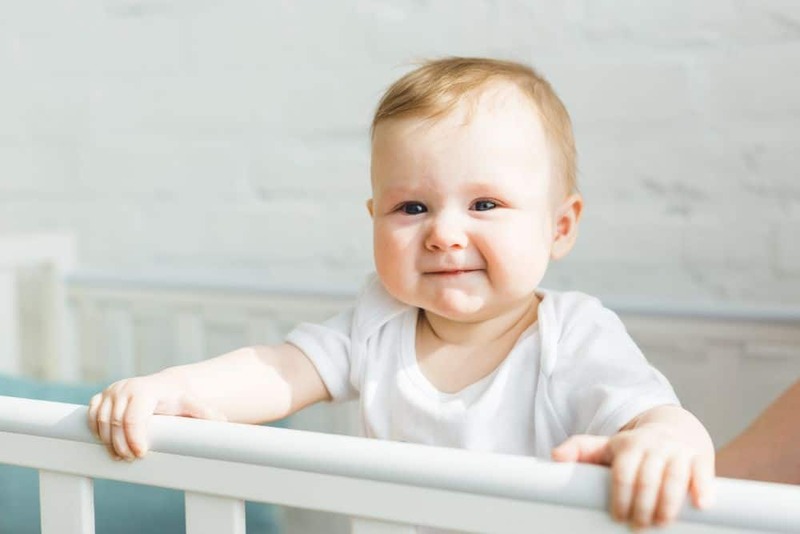 It’s also safe to raise the crib mattress to the highest setting if your baby is a newborn — but if you want to raise the mattress as your baby gets older, you should reconsider. Your baby’s crib should be lowered by half a notch, or even an entire notch, once they’re able to sit up (source). This usually happens between 5 and 8 months of age. Once your baby can pull up on their own you should adjust the mattress to its lowest setting for your baby’s safety. If you have a little one experiencing GERD or congestion, you may want to incline their mattress. Never do this with an object placed on top of the mattress itself. Remember — sleep positioners, blankets, and pillows all create a serious suffocation risk for your baby. A safer option is to create an incline by placing items under your baby’s mattress. You can use specialty anglers, blankets, pillows, or even towels to create a 30-degree (about 6 inches) incline for your baby. Simply place the items under the mattress until you reach the desired angle. As with raising your crib mattress, there will be times in your baby’s life where may need to lower it. Your baby is growing after all, and your crib will need to be adjusted. Lowering your baby’s crib mattress is usually done for safety reasons. No one wants their baby to fall out of the crib and onto the hard floor below, even a carpeted one! Lowering your baby’s crib mattress is perfectly safe — in fact, when the time is right, it will make their crib even safer. Every year 10,000 children are taken to the emergency room for crib-related accidents, with many related to children falling out of their crib (source). This means you’ll actually want to adjust your crib height more than once as your baby grows. You don’t have to adjust the crib height to the lowest setting right away, but you do want to lower it as soon as your baby can sit up. As soon as a baby sits up, they’re on their way to pulling themselves up to a standing position. A baby who pulls up can flip themselves over the crib rails if the mattress is set high enough. As your baby grows you can lower the railing until it reaches its lowest setting. Once your baby reaches 36 inches tall it is recommended that you move them out of the crib and into a toddler bed. Lowering your crib’s mattress is a little more complicated than raising it up on an incline, but it’s still easy enough to do on your own. If you’re unsure about any steps, check the manufacturer’s instructions — in paper or online. Choose height: Decide which setting you want your crib to be. It’s a lot easier to decide this before you start, that way you aren’t doing it while holding screws in your hands. Remove bedding: Take the sheets and mattress protector off of the mattress, to keep them from getting snagged or torn as you move down the mattress. Make adjustments: Take the screws out of the foot of the bed and lower the mattress to your desired setting. When you are done with the foot of the crib do the same at the head, and insert screws again, ensuring the mattress is stable. Reset: Refit your mattress protector and sheets onto the lowered mattress. There are many reasons to adjust your crib mattress’ height and angle. It’s safe to both raise and lower the mattress height as long as you do it correctly. The important thing to remember is to follow the guidelines: keep your baby’s crib clear and watch their development so you know when to lower their crib! Do you have any advice on adjusting your baby’s crib height? We’d love to hear your ideas in the comments section below. And if you know parents who are having crib struggles, share this article with them and spread the knowledge! Is My Baby Ready To Sleep In A Crib?